Make double digit (2-digit) addition and subtraction fun! Great for morning work, math centers, or an early finisher activity. Students solve equations and then color numbers on the 120 chart a certain color based on their answers to reveal a hidden picture within the chart! 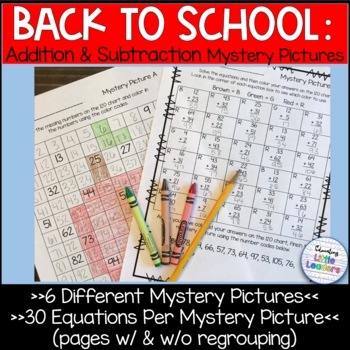 There are 30 2-digit addition and subtraction equations per mystery picture. If more than 30 numbers need to be filled in to make the picture, there are color codes on the bottom of the equation page listing the rest of the numbers needing to be colored. Fall and Winter themes coming later in the year. 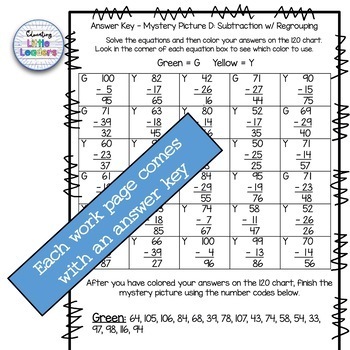 Also, if you have some students who need to work on basic number recognition and number sequencing, check out the 120 Mystery Pictures. Remember, leaving feedback on purchases earns you TPT credit to use on future purchases!